WASHINGTON, Nov 8 (Reuters) - Allowing income tax rates to rise for wealthy Americans, and maintaining rates for the less affluent, would not hurt U.S. economic growth much in 2013, the Congressional Budget Office said on Thursday, stepping into a dispute between Republicans and Democrats over how to resolve the so-called "fiscal cliff." 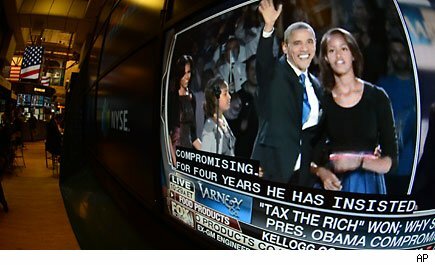 The report by the authoritative non-partisan arm of Congress is expected to fuel President Barack Obama's demand for higher taxes on the rich, part of his proposal to avoid the full impact of the expiring tax cuts and across-the-board spending reductions set to begin in early 2013 unless Congress acts. "One of the messages that was sent by the American people throughout this campaign is ... (they) clearly chose the president's view of making sure that the wealthiest Americans are asked to do a little bit more in the context of reducing our deficit in a balanced way," senior White House adviser David Plouffe said. The disagreement over the tax cuts is a major roadblock to any agreement in Congress, as it is coupled with the spending issues also on the table. The lack of progress in ending the standoff is spooking global markets, which fell again Thursday in part because of political uncertainty in Washington. The concern was underscored by the credit rating agency, Standard & Poor's, which said on Thursday it sees an increasing chance that the U.S. economy will go over the cliff next year. But it also said it expects policymakers will probably compromise in time to avoid that outcome. Analysts at the agency see about a 15 percent chance that political brinkmanship will push the world's largest economy over the fiscal cliff. With only five days remaining before the U.S. Congress begins its post-election session, top political leaders in Washington provided little new assurance Thursday that they can act in time. In an interview with ABC Television's Diane Sawyer, Boehner repeated what he has been saying for two years: "Raising tax rates is unacceptable. ... Frankly, it couldn't even pass the House. I'm not sure it could pass the Senate," he said, according to a transcript provided by the network. The Democratic White House did not respond publicly to an initiative launched on Wednesday by Boehner to get talks going to avoid the cliff. The president is scheduled to make a statement on the economy Friday. In the absence of concrete developments, the CBO report became the focus of argument Thursday. Reports by the CBO are designed to assist Congress in making difficult fiscal decisions, but they are also used by partisans to bolster their own arguments. A statement from the Republican-controlled House Ways and Means Committee said the CBO report "confirms that raising taxes on all taxpayers will result in fewer 'help wanted' signs hanging in the windows of businesses across the country. Job creators agree, and have made it clear, that raising taxes will result in a weaker economy and fewer jobs for the millions of Americans struggling to find work." Democratic Rep. Chris Van Hollen, ranking member of the House Budget Committee, said the report "underscores the need to prevent the so-called fiscal cliff from harming American families and businesses, and to instead enact a balanced, long-term deficit reduction plan." The term "balanced" plan is the Democratic code for tax increases. The tax cuts were enacted during the Bush administration, but were made temporary, in part to reduce the appearance of exploding the already soaring U.S. deficit over the long term. They were extended in 2010 for two years under an agreement between Republicans and Obama, after Republicans swept the mid-term elections that year and took control of the House. That extension is running out, just as the trigger date arrives for automatic spending cuts Congress approved in 2011 as part of a deal to avoid a default on U.S. government debt. The report from CBO laid out the economic effects of a number of options that lawmakers will consider as they deal with the fiscal cliff events. The CBO said extending all of the tax cuts would boost U.S. gross domestic product growth next year by a little less than 1.5 percentage points. If the tax rates were extended only for individuals earning less than $200,000 and couples earnings less than $250,000, CBO said, growth would rise by 1.25 percent. Wall Street estimates show third-quarter GDP growth was 2.8 percent. Unemployment is currently at 7.9 percent. Eliminating the automatic spending cuts to military and domestic programs would add back 0.75 percentage points of growth, as would extending an expiring payroll tax cut and long- term unemployment benefits that are expected to end next year, the CBO said. But the office also warned of the consequences of taking such actions without reducing deficits that have run at $1 trillion in each of the past four years. "CBO expects that even if all of the fiscal tightening was eliminated, the economy would remain below its potential and the unemployment rate would remain higher than usual for some time," the report said.